I find it slightly contradicting that I happen to be sharing Creamy Homestyle Chicken Noodle Soup on the hottest, most miserable day we’ve had in weeks. However, the fall soup show must go on – regardless of what the thermostat says. Thankfully, it appears to be the last day in a lineup of almost-equally miserable days, and if the forecast can be trusted, cooler fall temperatures are coming in the near future. 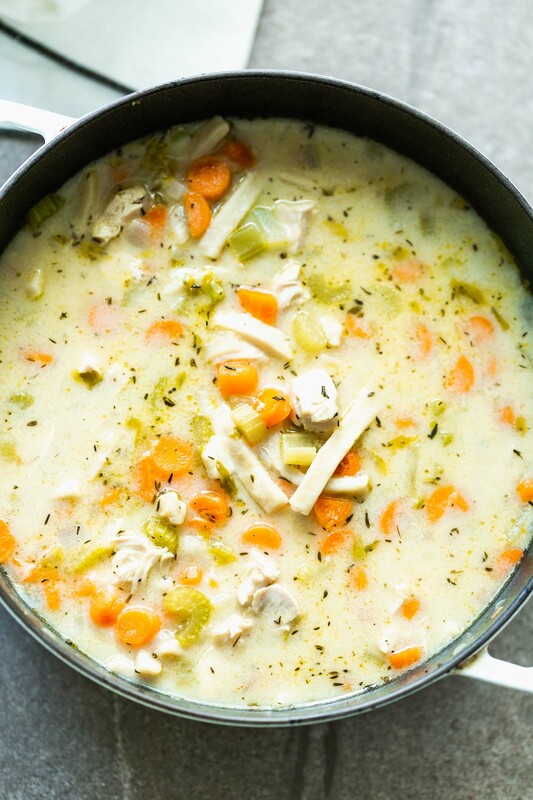 Which means you’re going to need this soup recipe in your back pocket ASAP. 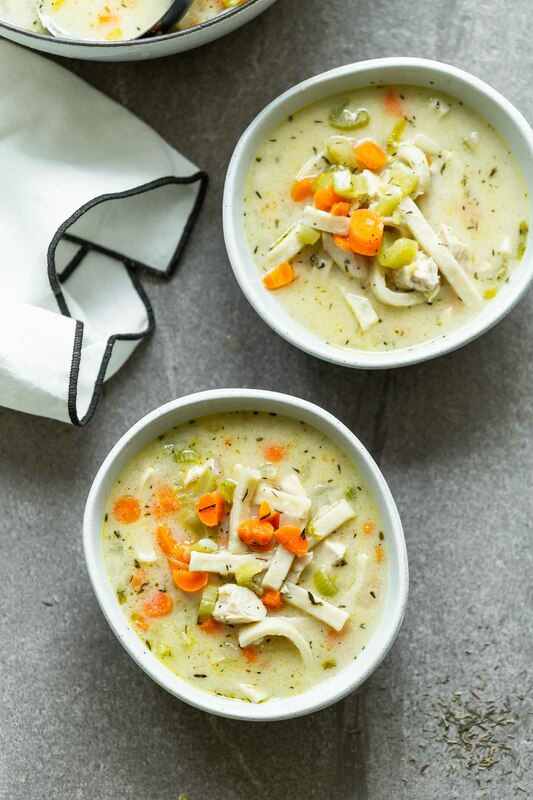 My favorite soup growing up was an almost identical version as today’s, my Mom made it countless times over the course of every fall and winter I can remember, and while I follow the original recipe pretty closely, there’s one ingredient purposefully absent – cream of chicken. You know it, you may love it, you may hate, but it was secret ingredient in virtually all delicious casseroles and soups from the 90s, and still lingers in old family recipes and church cookbooks to this day. While I don’t find it completely appalling, I really strive to develop recipes that have as many unprocessed ingredients as possible. A few years back, after I had a serious craving for chicken noodle soup on a crisp, fall day, I set out to recreate the soup, sans the can, and I’m happy to say, I’ve created a winner. 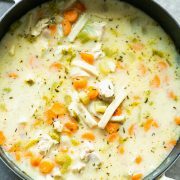 After a little bit of trial and error, I found the best way to mimic that thick, creamy texture was a combination of a quick roux and the addition of a little bit of whole (or low-fat) milk to the broth. 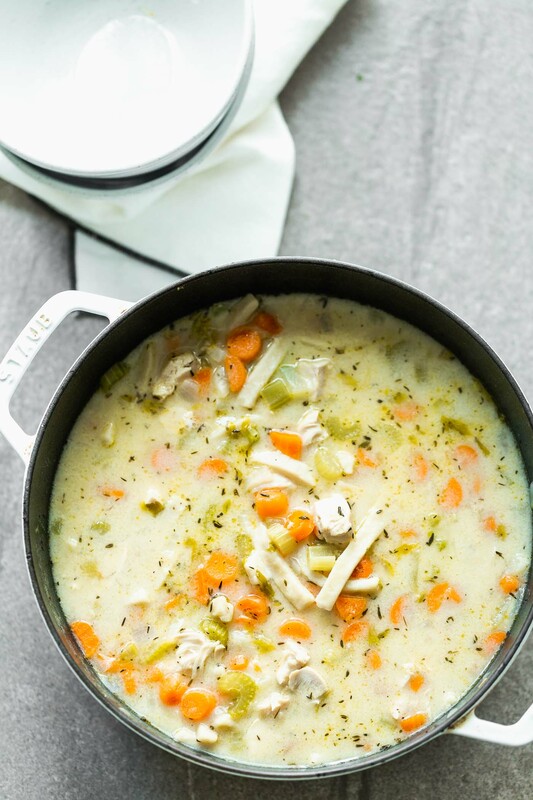 The combination of chicken stock and milk create the perfect balance of brothy and creamy, and I could honestly slurp it up sans the veggies, noodles and chicken and be completely content. Obviously, all the usual suspects are there: carrots, onion, celery, and plenty of garlic. I like to add a hit of sherry for an unexpected punch of flavor, thyme, which for me, is essential in chicken noodle soup and a few bay leaves. Even though we’re using quick-cooking chicken tenderloins, poaching them in the broth as opposed to cooking them beforehand adds even more complex flavor without any additional ingredient. I try to be careful of overcooking the chicken, so once they’re all done, I pull them all out, cut them into bite-sized pieces and then pop them back in just before serving the soup. If you’ve never had homestyle egg noodles, you’re in for a treat! The texture is kind of in between a pasta noodle and a dumpling. They’re much heartier than the egg noodles you typically find in chicken noodle soup, and because they soak up liquid like a sponge, the flavor of the broth is almost infused into each bite. I ADORE them. The only downside is they take a while to cook, but I think the longer the soup simmers, the better it gets. Of course, at the end I like to season with PLENTY of salt, because there’s nothing worse than a bland cup of soup! With something as simple as chicken noodle soup, you really want to make sure every bite is perfectly seasoned. Serve with a crusty hunk of bread and enjoy! 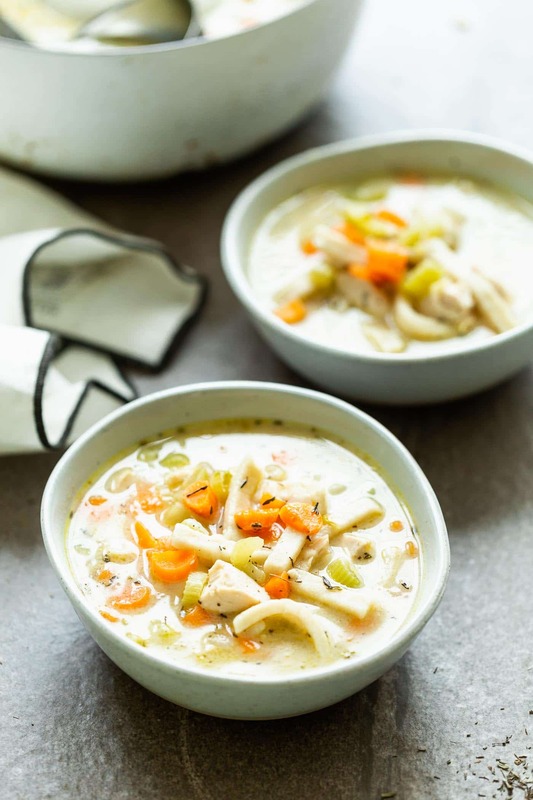 The BEST Creamy Homestyle Chicken Noodle Soup - full of hearty eggs noodles, TONS of veggies, tender chicken and a sherry-infused chicken broth that's comfort in a bowl. Heat a large stock pot to a medium heat. Add butter. Once butter has melted, add onion, carrot, celery and 1 teaspoon salt. Sweat the veggies until slightly softened, about 3-4 minutes. Add thyme and garlic, cook another minute. Add flour, stir to coat veggies. Add sherry, chicken stock, milk, bay leaves, remaining salt, and egg noodles. Bring to a boil and reduce to a simmer. Simmer for 10 minutes, and then add chicken tenderloins. Simmer until chicken has cooked through, about 6-7 minutes. Once chicken has cooked through, remove from pot and Cool slightly. Continue to simmer the soup. Once the chicken has cooled slightly, cut into bite-sized pieces, set aside. Continue to simmer the soup until the egg noodles are cooked, about 10-15 more minutes. They should be soft and plump. Add chicken back to the soup. Season to taste with salt and pepper. I use these egg noodles! 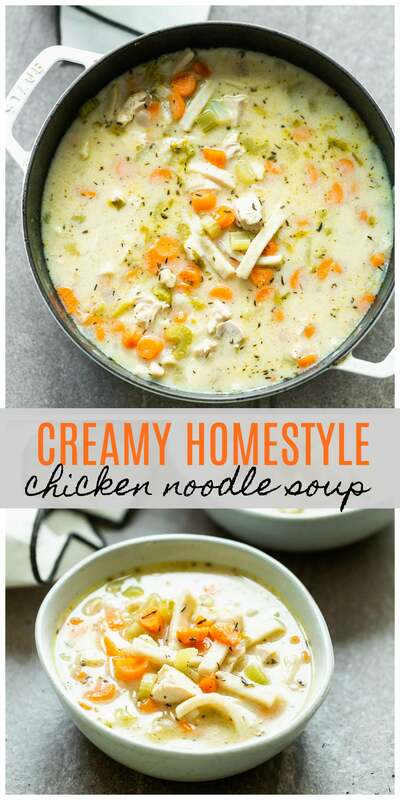 8 Responses to "Creamy Homestyle Chicken Noodle Soup"
Made it!!! Loved it!. Perfect! LOVED it! Perfect when its cold out, thick and creamy deliciousness; you’ll want a 2nd bowl! Hi! I wanted to ask you about the water. You didn’t use any in this soup? Just milk? No water! Just chicken stock and milk! Not feeling well so, I decided to make some soup.. EXCELLENT recipe, easy to follow and the soup is AWESOME!! Love the addition of milk for that extra creaminess. I used dry wheat spaghetti noodles instead of the noodles mentioned in the recipe. WILL MAKE AGAIN! !